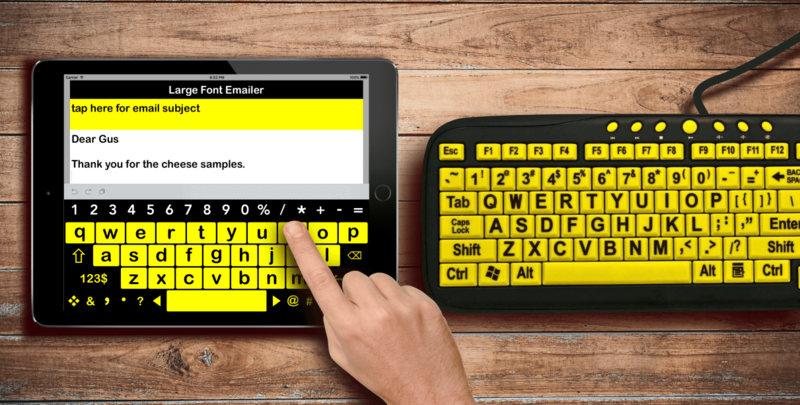 Big Keyboard for Low Vision App for Low Vision users. for Low Vision iPad users. Watch this demo to see it in action. Made with the biggest possible Buttons and Large Print Font, it is far more readable for visual impairement, than the standard Keyboard. It is designed to be intuitive and packed with one touch short cuts. 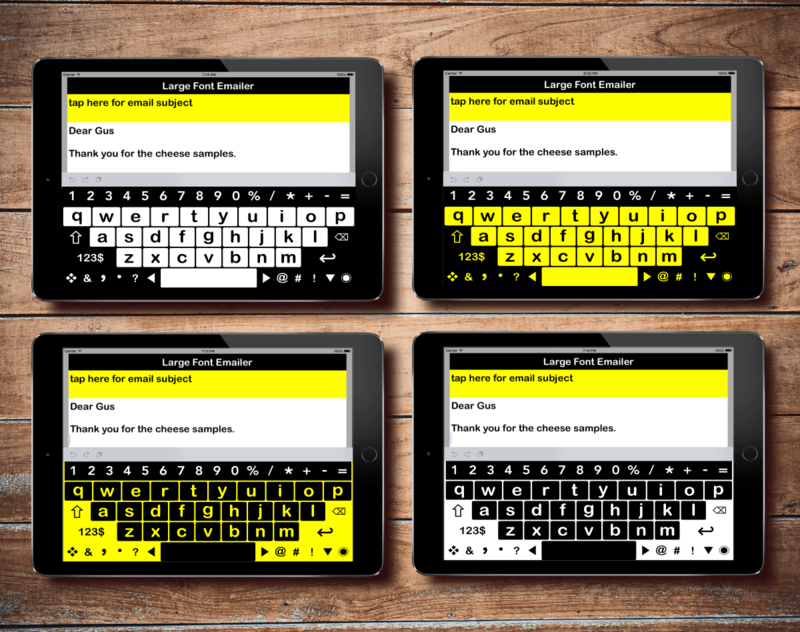 Big Keys is an improvement on an actual Low Vision Keyboard. Numbers, Accents and Symbols are in the top Black Bar. The most common punctuation including the '#' and '@' keys for Social Media are grouped near the bottom on a different color background for easier visual differentiation. You get one touch access without having to press the shift key at the same time. Big keys has 4 modes for brighter day light and darker lighting at night. It's High Contrast all the time. There is also an invert mode to match the iPad color inversion setting when you want low glare viewing. Big Keys is easy to use, Numbers and Symbols are clearly seperate from the Alphabet keys, all need to do is to swap out is the top bar. Press $123 to switch between numbers and symbols. Skip a letter backwords or forwards to amend a word instead of deleting and re-typing the whole word. 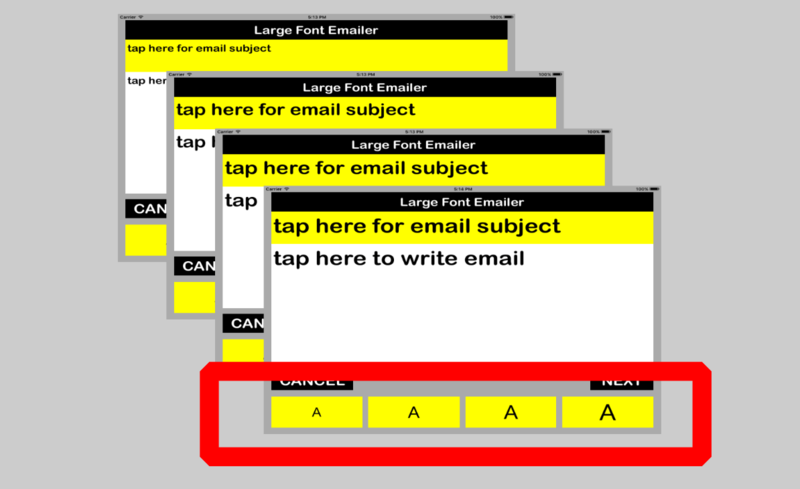 Long Press on an accent accent and slide sideways and lift off on when the correct accent is selected. Swipe up on any alphabet key and it will become a Capital Letter. Tap once to delete a letter and time or swipe left to delete a whole word. Big keys has a Bonus Built in Large Print Emailer. There are 4 Large Print Sizes to choose from. 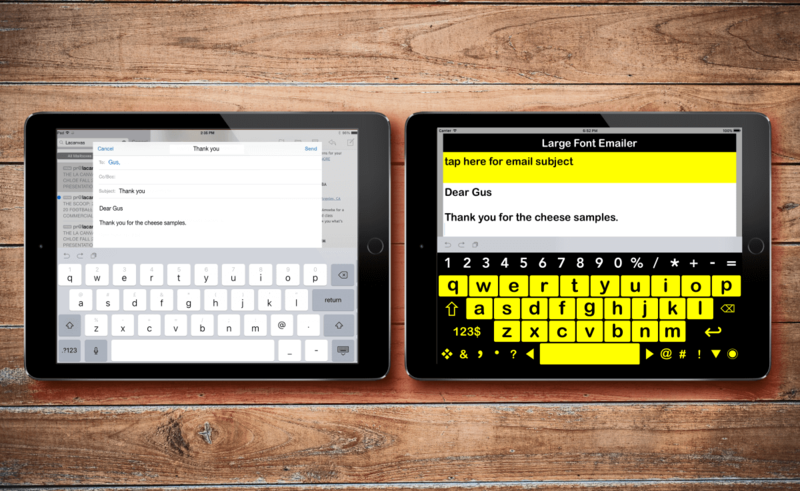 This allows you to type out your email and review it in Large print before sending it out.